Andrew Urquhart, David Campbell and Jason Carrison took control of Whytes earlier this year and the company celebrates 50 years in business in 2017. Staff at the Newmachar-based company are putting the finishing touches to a new tour brochure which will be rolled out in the New Year when bookings open for 2017. 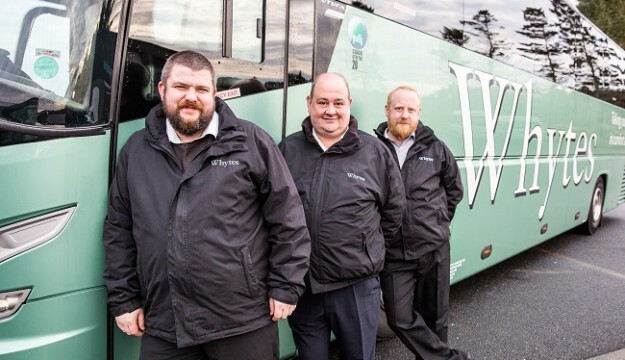 The company came under new management earlier this year and is getting its tours business back on the road after a three-year break from the market. 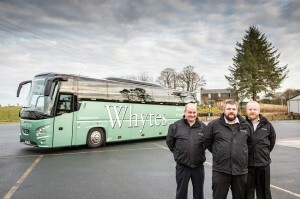 L to R – David Campbell, Andrew Urquhart and Jason Carrison are the driving force behind Whytes re-entering the tours market. The new tour guide will offer trips across the UK in 2017 and will run from the end of March to the first week of October. Thereafter, a winter programme of Christmas market visits and New Year tours will be available. Mr Urquhart, who is a grandson of company founders Bill and Nora Whyte, is the driving force behind the company’s decision to re-enter the tours market. He said: “We’re very keen to get back in to the coach tours market and are looking forward to an exciting year as the company celebrates 50 years in business. Customers from across the north-east will be able to take advantage of Whyte’s feeder service which provides collection from across the region as the coaches leave from Newmachar. Once the coaches are on the road south bound pickups will also be available from Aberdeen, Dundee and Perth.